Due to changing staffing levels or strategic direction, you may want to add more furniture to your environment, such as workstations, casegoods, seating, storage cabinets and more. However, sourcing these items on your own can be very time consuming and costly. And if a particular manufacturer is no longer producing the furniture you need, then you’ll need to wade into the pre-owned market – which only adds to your time and risk burden. Fortunately, our office furniture sourcing solution is the efficient and cost-effective way to ensure that you get the furniture you need, while avoiding obstacles, challenges and risks. We’ve built a vast nationwide network of reputable new and used furniture dealers. As such, we can quickly help you find the furniture you need whether it’s in the wholesale or pre-owned market. What’s more, our access to thousands of potential sources means that we can help you find the best price. You may not be in a position to immediately add your new furniture into your environment. If so, then we can safely and securely store all of your items for as long as you wish – whether it’s a matter of days, months or even years – at our state-of-the-art 100,000 square foot storage facility. 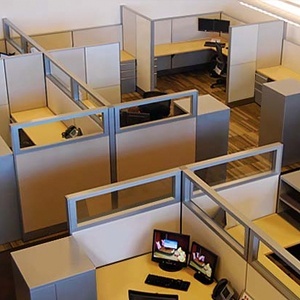 We’ll help you build a customized office plan to ensure that your new furniture integrates with your existing furniture, optimizes your available space, and supports your workflow needs. Call or email us today to learn more about our end-to-end office furniture sourcing solutions.